The hauntingly beautiful chapels beneath Rome’s church of Santa Maria della Concezione dei Cappuccini served as the burial chambers for Capuchin friars for centuries. As there were more bodies than space, older graves were dug up, and bones of the dead were used to create intricate designs decorating the chapel walls and ceilings. The Capuchin Crypt, a series of six small chapels used to bury Capuchin monks who died between 1528 and 1870, ultimately held around 3,700 bodies interred in the crypt’s sacred soil brought directly from Jerusalem. You can walk through the bone chapels to admire the unique decorations created by the skeletal remains of the deceased, said to be a reminder of the fleeting nature of mortality. The best way to understand the historical and religious context of this remarkable site is to join a small-group crypts and catacombs tour. These tours typically visit the Capuchin Crypt and accompanying museum along with the ancient Roman catacombs under the Basilica of San Clemente with a tour guide. To avoid the daytime crowds, you can also opt for an private tour with exclusive after-hours access to the crypt. This is a slightly macabre stop, so is not recommended for children or anyone who is claustrophobic or squeamish about human bones. The crypt is not a haunted house, but a sacred burial space. Wear modest clothing, covering shoulders and knees, and maintain a respectful decorum. The crypt is not accessible to wheelchairs or strollers. The Santa Maria della Concezione church is on Via Veneto, not far from the Piazza Barberini metro stop on line A. The Capuchin Crypt is underneath the church and has its own designated entrance. The Capuchin Crypt is open year-round; check the website for hours. The underground site is a cool reprieve from the summer heat, yet can be very crowded during this time. Modern Rome sits on top of thousands of years of history, which is why the capital of Italy is known as the Eternal City. One of the best ways to explore the city’s remarkable past is by taking guided tours through Rome’s many underground sights, including remains of villas and monuments from ancient Rome as well as medieval crypts and catacombs. The Capuchin Crypt—monk-bone-laden chapels underneath the Church of Santa Maria della Concezione—is one of Rome’s most macabre attractions. It’s also, it turns out, a great place to see religious art. With this tour, skip the stuffy Vatican and head for a guided visit of the Capuchin museum and church, home to a Caravaggio painting, and then sit for a concert of Gregorian chants and polyphonic sacred music. Peel back the layers of Roman history—quite literally—with a thrilling exploration of its underground tombs and chapels. Visit the Catacombs of Santa Priscilla, home to stunning frescoes and thousands of centuries-old bones, including those of two Catholic popes. Learn about early Christianity from your guide while meandering the endless darkened tunnels. Next up is the Capuchin Crypt, where you'll find the artistically displayed bones of 4,000 Capuchin monks. Finally pay a visit to Nicola in Carcere and be surprised of how many layers this incredible "lasagne church" has. Step into a shadowy world beneath the streets of Rome for a guided tour of the city’s crypts and catacombs. With a guide, you’ll visit the Catacombs of San Sebastiano or San Callisto, exploring subterranean tunnels and burial sites that are steeped in macabre history. Venture onward to the Capuchin Crypt with its bone-lined walls and skeletal remains, then visit the Crypt of the Three Skeletons for an intro to the myths of Ancient Rome. Numbers are limited to just eight per group for a small-group experience. Explore the eerie underworld beneath Rome’s streets on this private skip-the-line tour of two of the city’s darkest sites: the Capuchin Crypt and the St. Sebastian Catacombs. After pickup from your hotel, visit the crypt where the bones of almost 4,000 monks decorate walls, ceilings, and even chandeliers. Next, follow your personal archaeologist through the tunnels where early Christians buried their dead, as an iPad reveals how it once looked. Many people have visited the Trevi Fountain, but few have ventured underneath it. Go behind the scenes to discover Rome’s original aqueducts—along with two other of Rome’s best-kept secrets—on this family-friendly underground tour. Children of all ages are welcome, with entertaining commentary from your own private guide. You’ll also get a peek at a subterranean stadium, and wander through a crypt made entirely of human bones. If you have been to Rome already or you prefer a not ordinary tour for your kids, we think they will love our 3 hours tour to discovery of Rome’s Undergrounds. Our super child-friendly guide will drive them into the dungeons of Crypt of the bones, Vicus Caprarius and Domitian Stadium, fascinating them with the intriguing stories hidden behind these beautiful monuments and ruins. Gain exclusive after-hours access to the Church of S. Maria Immacolata and the Capuchin Crypt during this concert experience in Rome. Celebrate the holidays by listening to a beautiful performance by the Schola Romana Ensemble, who specializes in a capella. Plus, get a special tour of the crypt, which is famous for containing the skeletal remains of more than 3,000 bodies believed to be Capuchin friars. Get the most out of your time in Rome during the festive season by going to a Christmas Baroque Concert in Piazza Navona. You won’t have to worry about waiting in long entrance lines as admission tickets are included. Enjoy an informative guided tour, which takes you to the Capuchin Crypt, before the concert begins at the Church of Sant’Agnese. You’ll hear music of the Sistine Chapel composers performed live by Schola Romana Ensemble. The venue has outstanding acoustic, and you’ll enjoy an impressive A cappella program. Benefit from personalized attention and plenty of time to ask questions by booking a private tour of the Roman Catacombs. With a guide dedicated just to you and your party, you'll be able to travel at your own pace as you explore the Catacombs and the Basilica of San Clemente. With the aid of an iPad and other visual tools, your guide will show you what the sites looked like at their origin so you can gain a full understanding of their history. On this 2.5-hour tour you will go down 15 metres underground discovering the four layers of St.Clement’s Basilica, and you will visit a creepy crypt covered by the bones of the capuchin monks.With multimedia tools, games and quizzes, your top-rated kid-friendly guide wil lead you on an exciting visit to St. Clement’s Basilica and the Crypt of the Capuchins.What are you waiting for? Join us and you will have a thrilling experience! Go back to 2000 years ago visiting the Saint Clements’s Basilica. Through its four layers you will go down till 15 metres underground reaching the old pagan temple dedicated to Mithra and warehouse dating to the 1st and 2nd centuries. Continue your tour to the Church of Santa Maria della Concezione dei Cappuccini and admire the creepy rooms of Capuchin Crypt decorated by skeleton remains of thousands monks. Join this 2.5-hour tour and you will be involved in a trip back to the history thanks to a profesional kid-friendly guide who will make you breath the atmosphere of the time using multimedia tools, coloured books, games and many other activities. Your children will learn a lot having fun! They will never forget this amazing experience! 700 km of mysteries and secretsAre you down for an adventure? Underground Rome - a terrifying labyrinth where nothing is expected or reasonable. The tomb of a saint, a lake, a church, an ossuary, or a skeleton warning you "What you are, I was; what I am, you will be. ”It’s a kingdom of shadows where you never know what to expect. They were lost and reappeared 3 days and 3 nights later, not in Rome but in Anzio, 30 km away. They speak of 700 km of exploded labyrinths, but they believe to be many thousands more, an immense multi-leveled spider's web spreading under Rome and the surrounding areas.Almost every recent church in Rome has a secret underground level, not as deep as the catacombs, but often more fascinating. If united together, they would create a city, another world full of secrets and mysteries of underground churches, perilous stairs, ruined walls, and the smell of saints and bones. Usually we walk ignoring what is below our feet. We look at the future and imagine the past, which is right under our steps.With only one day is not possible to fully hug what was the ancient Rome seven meters underneath the modern world, however, with this excursion you can visit some of the most significant underground sites of the eternal City, and get an idea of what was this incredible place, many centuries ago. Descend into Rome's dark underworld and discover how pagan Rome and Christianity collide, in the hidden spaces below the city's streets. On this spectacular tour, you'll visit 3 of the eeriest sights in modern Rome: the Catacombs of Domitilla, the underground of St. Clement's Basilica and the Capuchin Crypt. Join your expert guide and learn that the strangest rituals surrounding life and death, didn't die with the pagan world...Your tour begins at the Catacombs of Domitilla. Head 50ft inside the earth to discover this ancient burial site. See rare examples of Christian art beside pagan pieces, as you explore the labyrinthian Catacombs. Next, to the mediaeval Basilica of St. Clement, which hides an early Christian basilica of the 4th century, and a Temple of Mithras, a strange mystery cult who sacrificed bulls, among other weird rituals. 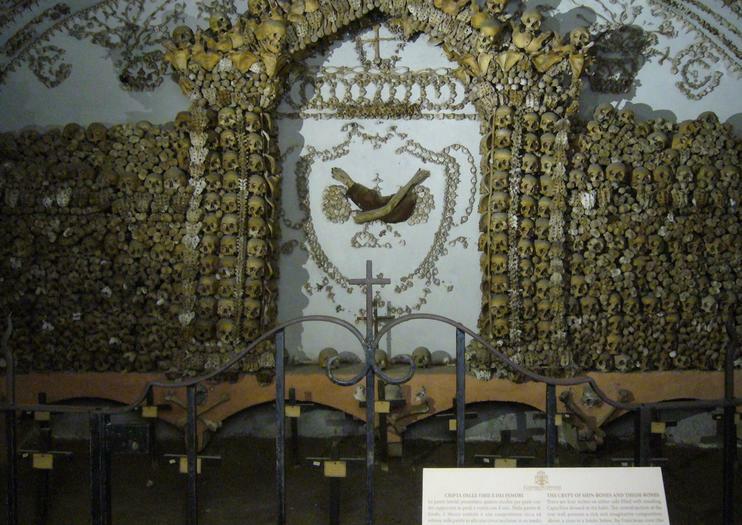 Finally, go to the Capuchin Crypt, and discover an eerie memento mori in the 17th-century crypt: the bones of 4,000 friars used as decoration.